Some even get to see their plays performed by professional actors. Bushwick Starr theatre eco-play cast and Superhero Clubhouse participating students. Photo credit: Bushwick Starr Facebook page. 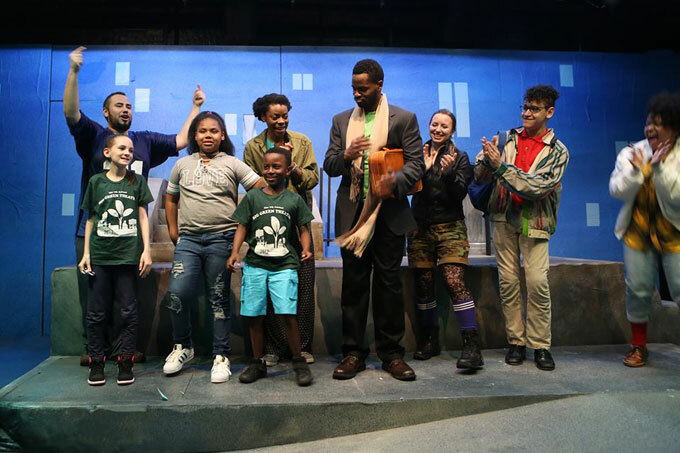 Environmental education takes center stage during the annual Big Green Theater Festival in Brooklyn, New York. This week of performances is the culmination of a three-month program. It’s taught by a collective of artists and scientists called the Superhero Clubhouse. That’s lead artist and co-teacher Vanessa Felix. She says the students study and write about topics such as how climate change affects sea-level rise, superstorms, migrating species, and more. *Correction 10/26/17: This sentence has been updated to reflect the fact that all of the students’ plays are performed.